Cast. Christopher Bengochea (Gustavo) seated at center. All photos by Barbara Mallon. (bottom to top) Sarah Cambidge (Amelia), Molly Hill (Ulrica the Sorceress), Christopher Bengochea (Gustavo). Eugene Broncoveanu (Ankarstrom), Christorper Filipowicz (Tom), Kiril Havezov (Sam). A highly dramatic opera with robust yet beautiful music, Un Ballo in Maschera (A Masked Ball) represents a fine example of Giuseppe Verdi’s dark and rich late period, and Livermore Valley Opera mines the work for all its brilliance. While the libretto works, it is one of the best examples of the stultifying effect of Italian censors on opera in the 19th century. Although commissioned by the great Teatro San Carlo in Naples, Verdi and his rookie librettist, Antonio Somma, couldn’t tolerate the extent of changes demanded there and moved the premiere to Rome, albeit with most of the same restrictions. The most offensive aspect of the storyline is that it concerned the real-life assassination of Swedish King Gustav III, and a regicide could not be tolerated by government censors. For that reason, Ballo became one of the rare European operas to be set in America, specifically, the colonies. Like many modern adaptations, LVO has chosen to site the opera in the historically correct Sweden. Although that temptation is understandable, Somma’s final characterizations had Boston and colonial governance in mind, and resituating does present some alignment problems. One advantage that is lost in using the Swedish setting is the strong socio-political motivation for the assassination. In many versions with the colonial setting, the conspirators are depicted as Indians or blacks who would have easily demonstrable issues with the governor. Along with murder, another of opera’s most common themes is the tragic love story. In Ballo, the plan to kill Gustavo intertwines with an illicit love story. The king is in love with Amelia, who happens to be the wife of his secretary and best friend, Anckarström. Ballo is striking and the score compels from beginning to end with highly melodious arias, ensembles, and orchestral interludes. What it lacks is any “Top 40” type hits, but it really doesn’t matter because every element thrills without being overly familiar. Yet, highlights do exist, and they are spread widely among the roles. Act 1 opens in the king’s court, where Verdi introduces a device that sets the mood of the proceedings – the constant presence of two sinister look-alike figures lurking on the fringes, the conspirators, Tom and Sam. The composer cleverly creates listen-and-comment sequences in which Tom and Sam react ominously in deep, dark tones to the central action in a manner known to the audience but not the characters on stage. The composer bequeaths the vocal fireworks in this act to two secondary female voices. In a topic more fitting to the Salem witch trials than to Sweden, a judge proposes at the king’s court to banish a soothsayer named Ulrica for supernatural practices. However, the king’s page, Oscar, leaps to Ulrica’s defense with the aria “Volta la terrea.” In this trousers role, bell lyric soprano Amy Owens absolutely delights with a bright, virtuoso coloratura rendering of the aria. Her petite youthfulness produces a characterization that is charming and highly believable. When the locale shifts to Ulrica’s hut, we are exposed to very different vocal style. Molly Hill is the sorceress, and she treats us to a rich and deeper female voice with “Re dell’ abisso affrettati.” Not knowing that she is telling the fortune of the king who appears disguised, she offers the revelation that he will be murdered by the next man who shakes his hand. Act 2 is notable for a stunning sequence of beautiful music with an interesting structure, opening with a soliloquy, followed by a duet, then a trio, and finally an ensemble built around a quartet, including the conspirators. Amelia’s soliloquy showcases the remarkably powerful yet mellifluous voice of Sarah Cambidge. 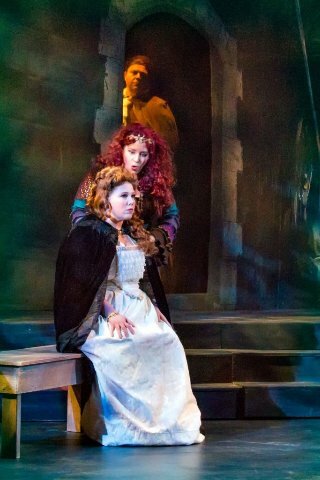 The soprano pulls out all stops in her mournful aria “Ma dall’arido stelo divulsa” as she prays to overcome her conflict. Joined by tenor Christopher Bengochea as Gustavo, they sing the signature piece and one of Verdi’s most beautiful duets, “Teco io sto…non sai tu” in which Amelia admits her love to him. But their privacy is soon broken by Anckarström, who hastens Gustavo’s departure to avoid their interception by the conspirators. 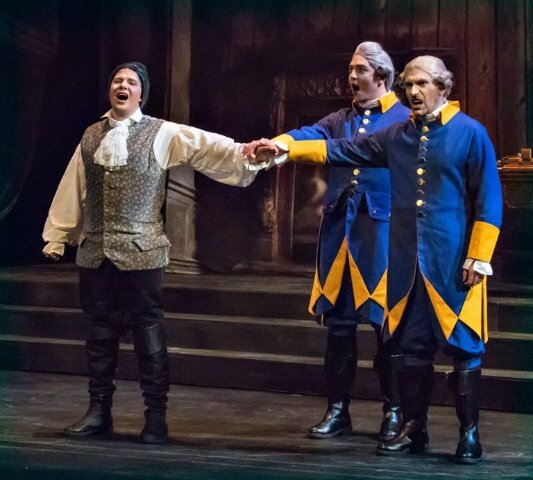 In the final act, Anckarström has become aware of Amelia’s love for Gustavo and expresses his resentment in “Eri tu che macchiavi.” An announcement had been made before the performance that baritone Eugene Brancoveanu who plays Anckarström had been ill but would perform and beg any forgiveness for his condition. But even on a sick day, this treasure for Bay Area opera fans sings sonorously and with seemingly effortless power. He is a great match for Cambidge in their duets as well. Their uncompromised volume could fill the largest opera halls with beautiful sound. LVO has chosen wisely. Un Ballo in Maschera has maintained its place in the repertoire with good reason, offering thrills throughout. This production entertains with several magnetic performances along with interesting staging and costumery. One bit of surprise is that the orchestra at 20 pieces is underpowered for this opera, although the beauty and character of its sound is in keeping with the demands of the score. Also, while the low lighting works for most of most venues in the opera, it appears too dim for the court scene. 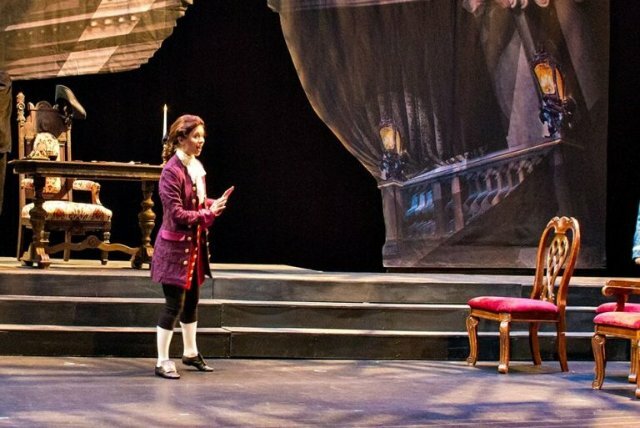 Un Ballo in Maschera composed by Giuseppe Verdi with libretto by Antonio Somma is produced by Livermore Valley Opera and plays at Bankhead Theatre, 2400 First Street, Livermore, through March 18, 2018.